Tag line: "You may rest assured that there's trouble, because Inspector Clouseau is on the case. (That's the trouble.)" Heavy on slapstick and broad comedy, the Pink Panther films may not be everyone’s idea of a good time. But I grew up watching these movies and, to this day, they continue to crack me up. The third entry in the series (after The Pink Panther and A Shot in the Dark), 1975’s The Return of the Pink Panther features some of the franchise’s funniest moments, and this time around it isn’t only Peter Sellers who gets the laughs. The famed Pink Panther diamond, the pride and joy of the country of Lugash, has been stolen. 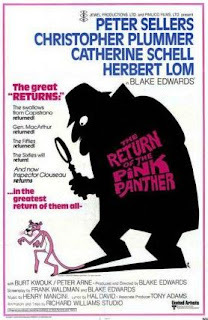 In an effort to recover the precious gem as quickly as possible, the Shah of Lugash personally requests that French Inspector Jacques Clouseau (Sellers), who tracked down the Pink Panther when it disappeared 10 years earlier, be assigned to the case. Though despised by his superior, Chief Inspector Dreyfus (Herbert Lom), who considers him a bumbling fool, Clouseau hops the next plane to Lugash and immediately goes to work. Following a brief investigation, Clouseau surmises that the thief is none other than Sir Charles Litton (Christopher Plummer), the same man who swiped the Pink Panther all those years ago. But Sir Charles has been retired for some time, and is enjoying the high life in the South of France with his gorgeous young wife, Lady Claudia (Catherine Schell). Hoping to prove his innocence, Sir Charles heads to Lugash to find the real thief while Lady Claudia leads Inspector Clouseau on a wild goose chase, telling him that her husband is vacationing in Switzerland. Will Clouseau once again recover the diamond, or will he instead fall victim to the unknown assassin who’s been gunning for him ever since he left France? From the moment he first appears on-screen, chastising a street beggar and failing to notice the bank next door is being robbed, Peter Sellers’ Jacques Clouseau has one hilarious misadventure after another. The high points include his various altercations with his valet, Kato (Burt Kwouk), who tries to keep Clouseau on his toes by attacking him when he least expects it; and his visit to Sir Charles’ mansion in France (posing as a telephone repairman, Clouseau practically destroys Sir Charles’ study while looking for clues). A master of physical comedy, Sellers’ timing is spot-on throughout The Return of the Pink Panther, and his antics are sure to keep you in stitches. To assist his lead, director Blake Edwards put together an impressive supporting cast. Filling in for David Niven, who played Sir Charles in 1963’s The Pink Panther, Christopher Plummer makes for a convincing ex-thief, and his run-ins with both the police and the criminal underground are as thrilling as they are funny (a chase through a Lugash night club, where Sir Charles must think fast to avoid being captured by an old rival, adds some excitement to the proceedings). Also quite good is Catherine Schell as a Lady Claudia, who lures Clouseau to Switzerland, then proceeds to keep him occupied while her husband is in Lugash. Best of all, though, is Herbert Lom as Chief Inspector Dreyfus, who, thanks to Clouseau’s incompetence, is slowly losing his mind. With his facial tics and nervous giggles, we know it’s only a matter of time before Dreyfus cracks, and Lom plays the part beautifully, garnering his fair share of laughs along the way (a recurring joke involving Dreyfus’ cigarette lighter, which is shaped like a handgun, is a definite highlight). With one uproarious sequence after another, The Return of the Pink Panther is every bit as funny as its predecessors, and serves as proof positive that, in the right hands, slapstick and physical comedy can still be effective.